Overview of the farm labor organization, the Coalition of Immokalee Workers, with artwork by Erin Currier. The Coalition of Immokalee Workers (CIW) is a Florida migrant worker-based organization recognized internationally for its human rights work. Built on a foundation of farmworker community organizing, the CIW runs food justice campaigns and combats the forced labor and exploitation of workers. Through the use of direct actions such as mass protests, 30-day hunger strikes, 230 mile marches, boycotts, etc., the CIW has won industry-wide wage increases and worker protections. 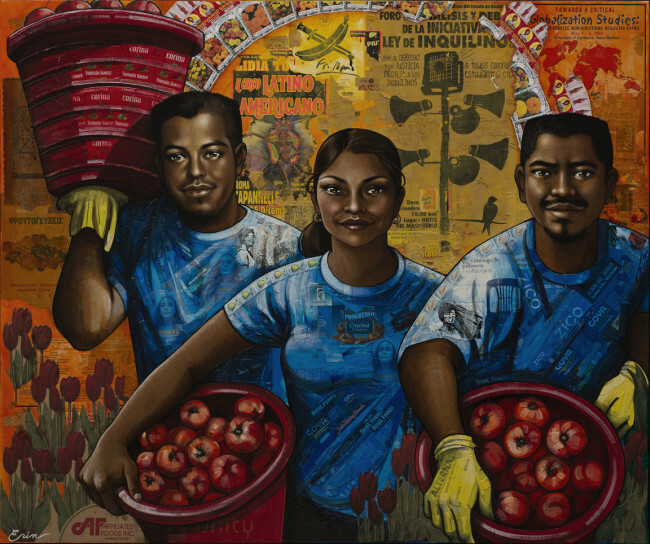 “The Harvesters” depicts three Coalition of Immokalee Workers cofounders: Gerardo Reyes Chavez, Nely Rodriguez, and Lucas Benitez. They are harvesting tomatoes. © Erin Currier. The CIW is perhaps best known for the “penny more per pound” movement which called for an increase of 45 cents per 32 pound bucket of tomatoes to 77 cents—a mere pittance for corporate tomato buyers like Chipotle, Wendy’s, Taco Bell, Whole Foods, Trader Joe’s—yet one that nonetheless translates to a more viable $80 for an average 10-12 hour work day instead of the previous average of $45. Over the years, through the Campaign for Fair Food and the emergence of the Fair Food Program, CIW has transformed from one of the poorest and most powerless communities in the country into a model of strong, committed leadership grounded in young migrant workers forging a future of liveable wages, as well as a hub for individuals from around the world engaged in the fight against human trafficking. Our dream is that we no longer be considered second or third-class citizens, tools which can just be thrown away after they are used. We dream of receiving the respect that human beings merit. We dream of the possibility to maintain our families with dignity, and to offer them the future that has been denied us for so long. We’re taking steps on the road that will open doors to workers in many industries, where the economic power of a few does not determine how a person will live his or her life, where money doesn’t determine if a person has more or less worth. Our dream will be realized when we have a just agriculture system, one that doesn’t step on the rights of the workers, where they are recognized as one of the most important parts of the industry. For the consumers, we hope to see a day in which, when one says “farmworker,” the word won’t be associated with powerlessness, voicelessness, inability to define one’s own destiny. Our dream is that when consumers think of who farmworkers are, they understand that we have taken up our pens to write our own history. We will continue dreaming and we will continue working together to realize our dreams. We have the notebook of destiny in our hands, and we’re writing it today. Our thanks to artist Erin Currier for giving the Zinn Education Project permission to post The Harvesters. This mixed media portrait depicts three Coalition of Immokalee Workers cofounders: Gerardo Reyes Chavez, Nely Rodriguez, and Lucas Benitez. Also see Currier’s portrait of Nicolás Guillén on this site. The description of CIW is by Erin Currier and the Gerardo Reyes Chavez quote is reprinted from Truthout. 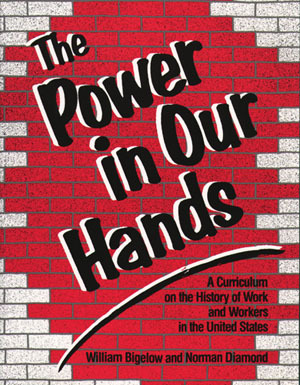 Find more resources for teaching about Latino and labor history on the Zinn Education Project website.